Six months ago, when Adrian and I tried to talk to Martin about his remaining challenges, Martin seemed almost indifferent. If anything, he avoided the topic. During that conversation, which was designed to highlight Martin’s strengths along with his weaknesses, we discussed what we’re “good at” and “not so good at”—nothing about a diagnosis or giving a name to Martin’s challenges. Subsequently, in one of our heartfelt bedtime conversations, I decided to offer Martin a more concrete focus. I asked whether he had ever heard of autism. (He thought he had.) Then I said that social situations are difficult because he used to have autism and still is catching up to his peers. Again I was met by apparent indifference. Martin said, basically, “Oh.” I didn’t push the topic, but since then I’ve used the word “autism” occasionally: We eat a special diet to make sure the autism stays away, we take pills to finish getting rid of the autism, &c.
Martin never followed my lead and talked autism. Until now. Over the past week, Martin seems to have become interested in autism. He’s asked questions designed to help him understand himself: “Does autism make me interested in adult topics?” Really not sure what he meant by ‘adult topics’! I’m telling myself he meant literature and history . . . . “Does autism make me see things different from other kids?” In these questions, he uses the present tense, as in, how does the fact of autism, regardless of whether it’s the current diagnosis, affect me today? I’ve been trying to imagine that anguish. He recognized his name yet had no means to show us. He’s forced me to impart some elementary biomed theory, as when he asked, “Why was I born with autism?” I responded by attempting to explain that something hurt his wellness system, whether before he was born or after. I referenced his uncles to explain that troubles with wellness systems run in families: Both my older brothers have asthma and environmental allergies, and one also has food allergies and has suffered from chronic bronchitis. These were perhaps the responses that left Martin looking the most quizzical. Finally, he’s prompted me to reflect on my own feelings. He asked, “Do you think it’s fair that I used to have autism?” I started with honesty: No, I do notthink it’s fair that my son got autism. Then I tried to temper that answer by modeling gratitude. “Can you think of a friend who still has autism?” I wasn’t sure whether he would respond; we’ve never used the word “autism” in reference to any of his friends. But almost immediately, he named a little pal of his who uses “quiet voice,” i.e., whose verbal ability remains limited. I asked whether he thought his friend would like to be able to talk more, like he can now. Martin said yes, that he thought his friend would like to be able to talk more. I said that I’m thankful for Martin’s hard work and progress. My boy—whose verbal skills once were limited to echolalia but who, through biomedical intervention, has become able to express himself meaningfully through spoken language—guessed that his friend would also like to acquire spoken language. That’s Martin. I promise. It is. Because we are thinking about changing Martin’s school placement, Adrian and I decided to order a new neuropsychological educational assessment (a “neuropsych”). Martin also had a neuropsych three years ago, before he entered kindergarten, and last year. Those first two neuropsychs were completed by Dr. DS, a practitioner in Manhattan. This time we switched to Dr. PS, a practitioner in a suburb near ours, who knows our local schools and who had never before met Martin. Dr. DS and Dr. PS are mainstream neurodevelopmental psychiatrists, not biomed practitioners. Before Dr. PS started her testing, I enumerated Martin’s issues at this time: paying attention, sitting still, emotional regulation. I did not say “autism,” though she certainly must have seen that word on the previous neuropsychs and the school records I provided. We had our parent meeting with Dr. PS last week, after she’d had three lengthy testing sessions with Martin. She told us that Martin’s primary trouble lies in executive functioning. She diagnosed him with ADHD, compounded by social/pragmatic language delays. Adrian is Adrian. He likes concrete, definitive responses. He asked, immediately, “Um, why don’t you think Martin has autism?”—not the question I would have posed. I like to leave well enough alone. Dr. PS said that different practitioners come at executive functioning in different ways. Martin, she said, presents with “a little bit of this, and a little bit of that,” such that, perhaps, a doctor focused on autism might find a mild spectrum disorder. In Dr. PS’s opinion, however, Martin “does not meet the diagnostic criteria for autism spectrum disorder.” He presents much more strongly as a child with attention deficits. True, he retains difficulties with social/pragmatic language, but he is eager to socialize and keenly aware of others. No, she concluded, he doesn’t have autism. Martin can express himself, now. Martin doesn’t really have repetitive behaviors, anymore. Martin’s perseveration, which once was literal inability to stop speaking, has faded to a penchant for prattling about obscure topics, like marching bands and features of my car’s dashboard. Martin knows exactly what other kids are up to. He won’t let me affix a sport strap to his glasses anymore, because “Zach and John don’t have straps on their glasses.” Martin is awkward, socially, and his attention span has the half-life of hydrogen-7. But “autism”? These days, that seems too harsh. On the other hand, it feels strange—to say I don’t have a son with autism. We still have a lot of work to do with Martin’s executive functioning, and the spectrum has been a driving component of our life, even of my own identity. We socialize with other autism families. We swap articles about autism. I even pre-board airplanes, on the basis that “my son has autism.” (The pre-boarding will have to stop. I will let airline attendants draw their own inferences, but I won’t lie.) Autism, autism, autism. What do I do now? Find ADHD friends? Adrian and I have never been public about Martin’s diagnosis. Indeed, we’ve gone to lengths to hide his autism. In part, that’s because “autism” is a scary word. ADHD or ADD, not so scary. People seem to love to self-diagnosis with ADD. Maybe now we can go public with that moniker. Almost six years ago—the summer that Martin turned two—was when Adrian and I started to realize that Martin had “issues.” Other kids blew out the candles on their birthday cakes. Martin stared into the abyss over his own cake. (We later discovered he lacked the ability to pucker, or to blow.) In the toddler soccer program, when the coach said, “Run and kick a cone,” nine kids ran and kicked a cone. Martin wandered to the next field and tipped over the goal. By that fall, we were sufficiently concerned to ask a high-school friend of mine, an EI provider, to come take a look at Martin. She did, and she knew immediately that he had autism. The first psychologist, sent by New York City only a couple weeks after my friend saw Martin, said, “It’s autism. You might call it ‘high-functioning autism,’ or, ‘Asperger’s syndrome’.” But though Adrian and I didn’t realize it, Martin was backsliding. He had already lost eye contact and was becoming less responsive every day. By the time the Big Imposing Hospital’s neurodevelopmental team got hold of Martin, several months later, there was no mention of “high-functioning” or “Asperger’s.” They diagnosed Martin with moderate autism and threw in the kitchen sink of co-conditions: delays in every type of communication, low muscle tone and lack of proprioceptive awareness, sleep disorder, possible cognitive impairment, and on, and on, and on. Let’s call that the low point. Fortunately, we had already started biomed and the tedious brick-by-brick struggle to free our son from autism. When he was three, Martin’s special-needs preschool removed him from a self-contained 12-1-1 classroom (12 special-ed students, one teacher, one aide) based on his need for more supervision, and his inability to keep up with the other developmentally delayed three-year-olds. The school placed him instead in an 8-1-2 classroom, in which two other students had 1-on-1 aides (in total, eight special-ed students, one teacher, two classroom aides, and two dedicated aides). Martin was left in that classroom for two years. When it came time to find a kindergarten—we lived in New York City, where kids don’t just go to the local school, as they might elsewhere—we had Martin’s first neuropsych done. Dr. DS, the Manhattan neurodevelopmental psychologist, confirmed the autism diagnosis as “not a close call.” He told us that our desired elementary school, which has 12-student special-ed classrooms, would not provide enough support for Martin, and would be likely too advanced, academically. He said we were “really looking more at a need for 1-on-1 support” or a six-student ABA classroom. Forget that, Adrian and I decided. When the desired school, with the 12-student classrooms, accepted Martin, we sent him there. And he excelled. Two years later, before second grade, it was time for another neuropsych. To get a reasonably comparative assessment, we brought Martin back to Dr. DS. Dr. DS admitted that he had been mistaken to think Martin wouldn’t make it at our chosen school. In fact, Dr. DS was not so sure Martin still needed all the support the school offered. “I’ve seen some remarkable progress,” Dr. DS said when he presented us with Martin’s report. Martin had moved from the third percentile to the 83rd percentile in receptive language, for example, and though the autism was still prevalent, he had made tremendous gains in other areas, too. What were we doing? Destiny? I asked myself. Destiny didn’t resolve Martin’s receptive and expressive language delays. Biomed did. “What should we be thinking about for next year?” Adrian asked. Three components, said Dr. PS. First, the choice of school setting. Second, additional therapies and resources. And third, medication. It’s time to start experimenting to find the best medication for Martin’s ADHD. I’m tempted to write, Thank you, Dr. PS! There’s an addendum, however. I told Dr. PS that we are “hesitant” to medicate Martin because doing so would interfere with our biomed protocol. The progress we’ve made, I explained, has resulted from a restricted diet, supplementation, and constant reevaluation of Martin’s health needs. Dr. PS—remember, she’s a mainstream neurodevelopmental psychiatrist—asked pertinent questions, like what kind of doctor we see and whether the protocol is test-based. (There are charlatans in the autism-recovery universe. I know that.) After I provided sufficient reassurance on those points, Dr. PS said we are probably right not to medicate at this time. If what we are doing biomedically is working, she said, then we should exhaust that route. Experimenting with medication does not have a time limit, and it is okay to start later. So, actually, really, thank you, Dr. PS. Thank you for listening and reconsidering. And, for my readers, especially my long-term readers, here’s a special tidbit: Do you remember my lengthy post about Mr. and Mrs. Twice-Exceptional, the Quirky Genius School, and the movie The Imitation Game? You might want to revisit that one. As she was reviewing Martin’s test scores with us, Dr. PS pointed out a wide discrepancy in the different fields. In many academic areas, including reasoning and some language-based tasks, Martin’s scores were at the top of the bell curve, well above the average range. He uses his formidable intellect and those stand-out skills, Dr. PS said, to compensate for his still subpar executive functioning. I’d heard, vaguely, the announcer say something before Bon Jovi. I once had a child whose only language was echolalia, who could not independently string two or three words together. Can you imagine the joy in a moment like this? Two songs later: Phil Collins. Why Can’t We Cross the Finish Line, the Nonexistent Finish Line, Together? Bobby [a pseudonym] is eight years old and, according to Martin, his best friend. Bobby and Martin met in special-needs preschool four years ago, when Bobby was four years old and Martin was three. That’s also when I met Bobby’s mom, my friend Stacey [a pseudonym]. Bobby also has autism, and Stacey started biomed with him the following year, when Bobby was five. Stacey is given to panic. That is, she remains more susceptible than I am to the rollercoaster ride that is autism recovery. It is therefore possible that I did not completely, wholly, 100% believe her when, during the past few months, she’s said that Bobby isn’t doing as well as Martin, and that she’s not even sure they are still making progress in resolving his health issues. Two weeks ago, Martin and I had a rare opportunity to hang out with just Stacey and Bobby. After a few hours together, and with regrets, I had to agree with Stacey that Bobby is not doing as well as Martin. At the restaurant, Bobby impulsively put his hands in others’ food and bolted from the table. When we walked in town, he disappeared into store after store and cried about having to go to school the next day. 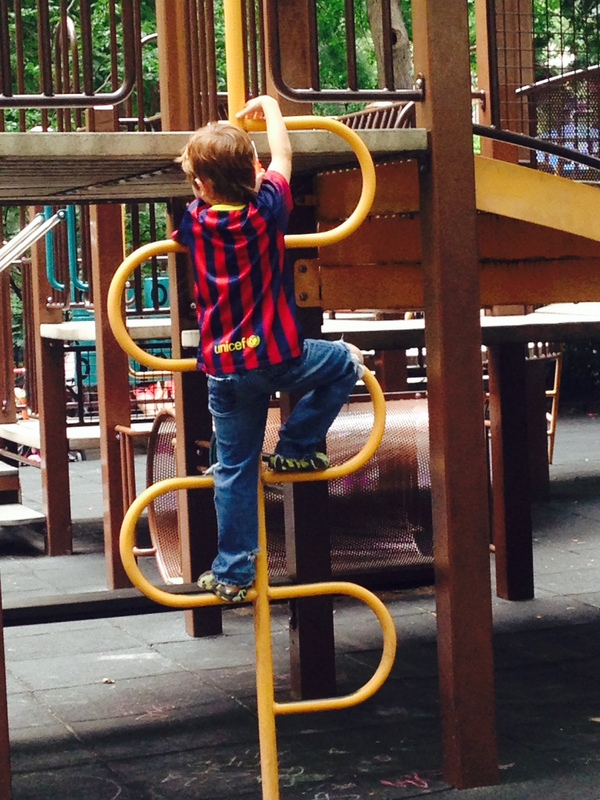 On the playground, he couldn’t swing by himself, aggressively hugged strangers, and melted down when it was time to leave. Martin, meanwhile, was perseverating a lot but otherwise looking pretty typical. Know that I discussed all this with Stacey, and she gave me permission to write this post. I would not blindside a friend on-line, pseudonyms or no. The afternoon’s low point, for me, came when Bobby was sitting on the sidewalk biting his own arm and I asked myself, “Is Bobby still the right best friend for Martin? Should Martin spend time with friends who challenge him more?” I would never want a mother to question whether Martin is the right friend for her child. I want Martin to be accepted by all kids, typically developing or otherwise. I was shortsighted and cruel to consider, even for a moment, directing Martin toward a higher-functioning friend. I recognized immediately that I was wrong and tried to turn the situation positive by asking Martin, “Your friend is having a difficult time. How can you help?” Still, there was no denying what I’d felt. There are plenty reasons why, even though Stacey works just as hard as I do, Bobby’s recovery might be lagging behind Martin’s. I had the advantage of starting biomed when Martin was just two-and-a-half; by the time he met Bobby six months later, they were developmentally akin, even though Bobby is a full year older. Stacey didn’t get to start biomed until Bobby was five years old. The boys’ underlying issues are so different. Not all kids respond well to biomed, and Bobby may be one who doesn’t. When I hear about other ASD kids making more progress, or faster progress, than Martin, it gives me hope. It also makes me angry and resentful. Why not our turn? Why not yet? What more do I have to do? I ask myself, Is that still true? Do I still feel angry and resentful when other kids make more progress? No. I don’t think so. Consider my friend Lakshmi and her son, Partha. I’ve written about Lakshmi before. Partha suffered a regression (lost all language) following a vaccination. We first met a few years ago when Lakshmi contacted me through this blog, and Partha was developmentally at about Martin’s level. Partha is recovered now, except for minor quirks; his mainstream classmates don’t know he had autism. That is much further along than Martin. When I see Partha and the progress he’s made, I feel happy for Lakshmi and inspired by what she’s accomplished. No resentment. No anger. Only the desire to continue sharing ideas over a cup of coffee. The same goes for my feelings about the other three recovered boys I know, as well as the kids I “know” through on-line chatter but have not met. I’ve reached my current sanguinity, likely, because Martin has made clear, significant, and undeniable progress toward neurotypicality. In the same post as the “angry and resentful” admission, I mentioned that I became frustrated with Martin for spectrum behaviors like skipping, chewing on a straw in the corner of his mouth, and letting himself fall slack. In a later post, I wrote about Martin whining continuously oh mommy oh mommy oh mommy for 30 minutes, and screaming all the way from our apartment to JFK because Adrian suggested that he change jackets. We are nowhere near that place anymore. The spectrum behaviors that frustrate me today are more like talking too loud in church, laughing at the wrong time, and taking too long to finish breakfast. Almost every day, my confidence increases that we will achieve something like recovery. I asked Stacey how she feels when she sees Martin or Bobby together, or when she sees Partha. (She knows Lakshmi and Partha too. We biomed moms all end up pals.) Stacey said that children who are recovering faster than Bobby make her depressed and anxious. She worries that she isn’t exploring the right treatments, and asks herself what more she can do (as I once asked myself, and sometimes still do). She fears that a mythical window will slide closed, separating Bobby forever from recovery. I admire Stacey for being hopeful for other kids while not letting their condition tint her outlook. I still tie myself to others’ children. Bobby’s performance at our play date has upset me terribly. I can’t feel as good about Martin’s recovery when I know not everyone is doing as well. Kind of a funny shot of Martin, acting pretty typical while enjoying calamari in a restaurant. Once upon a time, it was more difficult for me to witness biomed kids passing Martin. Today, I think, it has become more difficult to see the ones who lag. Let me begin this post by stating that nothing written here is intended to make fun of Martin. 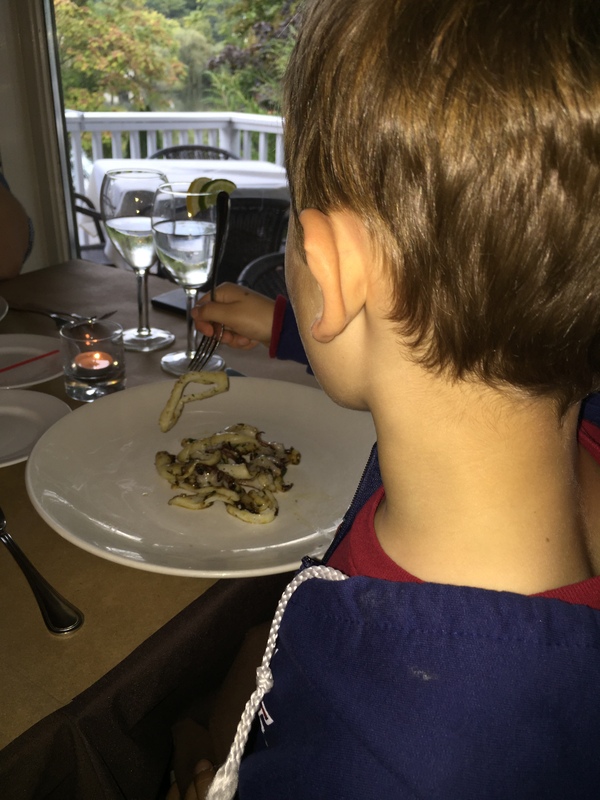 This is a post about language, oral stimming, perseveration, and behaviors that, for the most part, are not within Martin’s control. Although some of the verbal stream I’m conveying may, in retrospect, come across as amusing, when this is happening—when Martin is saying these things, nonstop—nothing sounds funny. When Martin is saying these things, nonstop, I could never laugh because I am too busy trying to keep my head from exploding. Martin has been talking a blue streak this week. I’ve written about this phenomenon before, when Martin starts speaking and cannot stop. It happens most in the morning. It used to be that Martin would repeat one statement, or one statement and several variations on that statement. As his language and other skills have improved, he’s broadened the repertoire. Now when he can’t stop talking, he cycles through many familiar topics. When I grow up I am going to live by myself. I don’t want to have any roommates. I am going to be a man who has horns. I am going to have long hair. Mommy, when I grow up I am going to eat peanut butter Lära bars. Do they still play concerts in Central Park? Can we go there? I want to go there. I’m not going to school today. Is it your birthday? Mommy, whose birthday is it? Your brother Rudy and your niece Mandy have the same birthday. How old did Uncle Rudy turn on his birthday? Mommy, Uncle Rudy turned 47 and my cousin Mandy turned six. Mommy, how old are you? You are 42 years old. Do all kids have middle names? Do you have to practice to be a crucifer? I’m going to be a crucifer when I’m in middle school. I’m never going to be a crucifer. I’m never going to school again. You should move out. Go! I’m going to live alone. I want you to be my mommy forever. Is Daddy going to keep going to work? When you were with Miss Cara and Miss Eileen and Miss Tomomi during my play date, what did you do? I want your family to have another baby. Are many of my friends only children? Are all of them? In the eighth picture about the fireplace, are you holding me when I’m a baby? When you were a child, was it allowed for children to ride in the passenger seat? You married your husband in 2005. Martin said all this, almost without pause, as he was sitting at the kitchen table drinking (or, as it were, not drinking) his bone broth. I’m never quite sure what sets Martin to nonstop talking, or whether a monologue like this is oral stimming, perseveration, attention-seeking behavior, anxiety, or some combination thereof. I’m frustrated when this happens, to be sure. I survive by focusing on Martin’s language skills. Do you remember when I was overjoyed that he managed to say, “I want you to do that again”? Compare that with the perfect sentences structures Martin rattled off this week. Those sentences were perseveration, and he could not slow down, but at least he had the words. At least he had the words. I work so hard, day after day, to give him language, and he uses it to break my heart? Slow down, kid. This might be more growth than I can handle.